The price of a EUR in Turkish Lira (EUR-TRY) has moved up from 5.00 to above 7.00 in the last 3 months, a rise by more than 40%. For currencies, even for emerging markets’ currencies, this is a dramatic move. Along with the spot rise, implied volatilities for 6-months options have risen from 15% to 30%, see Figure 1. How can a proprietary trader benefit from a view that EUR-TRY will stay above 7.00 in 6 months, but not cross the level of 12.00? We don’t want to spend a lot of money, i.e. we are looking at a zero-cost strategy; and we would like to run our strategy on a margined account. An idea that comes to my mind is a ratio call spread: we buy a 6-months EUR call struck at 7.00 for EUR 1 M, and sell a 6-months call struck at 12.00 for EUR 10 M (leverage factor 10, no kidding). On market data of 27 August (spot reference 7.20, ATM volatility 30.40%, 25-delta risk reversal 8.45%, 25-delta butterfly 1.581, EUR money market rate of -0.508%, forward rate 8.30895, implied TRY money market rate 29.549%, long call mid volatility 27.36%, short call mid volatility 41.58%), the mid price would be -4,000 EUR, so could trade a zero-cost for the investor and a sales margin of EUR 4,000 for the bank. Scenario 1 Lira strengthening: if the Lira becomes stronger, i.e. EUR-TRY drops below 7.00 in 6 months, then both call options are out of the money, so no payoff is generated. For a zero-cost initial premium, this is acceptable. We’ll try again in the next currency crisis. Scenario 2 Lira weakening further: if the Lira becomes weaker, i.e. EUR-TRY rises to a level of, say 10.00, then the long EUR call pays off 3 M TRY, worth EUR 300,000. The short EUR call is out of the money. Happy days. Scenario 3 Lira weakens dramatically: if the Lira becomes dramatically weaker, i.e. EUR-TRY crosses the 12.00 level, then also the short EUR call is in the money, and the position can theoretically generate an unlimited loss. However, the point of the strategy is that this scenario is considered highly unlikely. And if it really goes wrong, we simply sue the bank. Overall, this may appear very attractive to investors with a decent enthusiasm about leverage investing. It works, because the forward is going up, and consequently, the short call is worth a lot and additionally is priced with a high volatility because of a risk reversal of 8.45% in favor of EUR calls. However, the risk of the strategy for the selling bank is very high because of the investor’s high leverage and short option position with unlimited potential losses. Consequently, this would only be traded if the investor maintains a margined account. 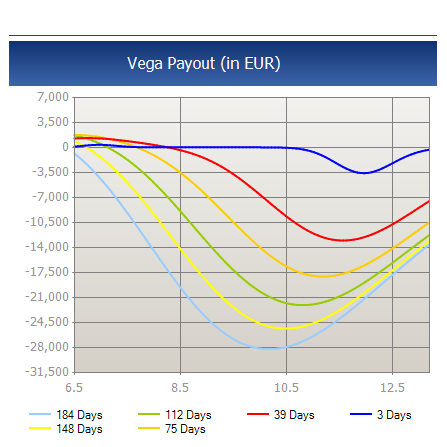 For example, and for simplicity, if the risk is 5 times the strategy’s vega, then the initial margin would be 5 time EUR 13,800, so EUR 69,000. This would be redeemed in scenario 1, and for scenario 2, the ROI is still in excess of 400% (800% p.a., as a clever sales guy would point out). The problem is that as spot rises, vega increases as can be seen in Figure 2, thus the investor can expect margin calls in a situation that he actually hopes to occur. If he can’t meet the margin calls, his position will likely be force-closed with a loss. How much margin is required on the way can be found out only if we know the method the margin for the structure is calculated. The five-vega rule-of-thumb isn’t actually too bad, but obviously simplified. You won’t believe how many such simplified margin calculators were in place in the last decade. In fact, I remember a Turkish trader who had taken exactly this view and position in the beginning of 2008, when he strongly believed that USD-TRY would rise from 1.20 to 1.60 within 6 months. And since he had so much of fun with his ratio call spreads, he had a whole portfolio of similar trades. The margin had been calculated a linear combination of vega and gamma, so just an inch more complex than my simplified approach. He could not meet his margin call that had come daily for sizes of USD 500k, so his position was force-closed. He had envisioned a USD 20 M profit, but ended up with a USD 20 M loss. He sued the bank, and ended up in a not very comfortable settlement of his case at the commercial court in London. I just thought I share this example of the past with you, as many investors might consider similar investments at the current market. I am not saying not to do it, but you might want to choose your law firm and experts wisely. Du liebst es Daten zu analysieren und daraus innovative Ideen zu entwickeln? Du bist interessiert an den neuesten Entwicklungen und Trends in den Bereichen Bilderkennung, Natural Language Processing und Neuronale Netze? Du hast bereits Erfahrung in datengetriebener Modellierung? Nimm die Herausforderung an und entwickle im Team eine einzigartige Data Science-Lösung. Dich erwartet ein spannendes Wochenende zusammen mit vielen motivierten Talenten in einem anregenden Umfeld. Triff interessante Leute, tausch Dich mit ihnen aus und miss Dich mit ihnen in einem Wettstreit um attraktive Preise. neue Prozesse und Big Data in die Praxis umsetzt, dann nehmen Sie die Rolle derjenigen ein, die diesen regulatorischen Tsunami für die europäische Finanzindustrie in den letzten Jahren beherrschbar gemacht haben: Lernen Sie d-fine kennen – nicht als Bewerber, sondern als Berater! Erfahren Sie, wie Sie Ihren mathematischen Hintergrund und Ihre analytischen Fähigkeiten einbringen können, um die Stabilität der Finanzmärkte zu erhöhen. Als Berater in einem Projektteam von d-fine werden Sie für die d-fine Bank AG ein Modell entwickeln, um das Institut rechtzeitig in die Lage zu versetzen, die neuerlichen Bewertungsanforderungen der Aufsicht zu erfüllen – hierbei handelt es sich um eine Arbeit direkt aus der täglichen Praxis von d-fine. Erfahren Sie durch die Teamarbeit mit Ihren Kollegen/-innen und in der Interaktion mit den Abteilungen der Bank, wie herausfordernd und vielfältig die Arbeit eines d-fine Beraters ist! d-fine ist ein führendes europäisches Beratungsunternehmen mit Standorten in Berlin, Düsseldorf, Frankfurt, London, München, Wien und Zürich. Mit über 700 hochqualifizierten Beratern unterstützen wir unsere Kunden aus Industrie, Finanzwelt oder öffentlicher Hand bei anspruchsvollen quantitativen, prozessualen und technologischen Herausforderungen. Strategieberatung, Fachberatung, Technologieberatung: d-fine ist alles in einem. 3-tägiger Workshop mit Vorträgen zur Finanzmathematik, einem Kundenprojekt unter Ihrer Beteiligung und Erfahrungsberichten aus unserer Consulting-Praxis.